1. On the morning we left Kentucky, Cort found a fantastic (and huge) moth in the bathhouse. We gingerly carried it outside, but as it had a broken piece on the tail wing, I don't know if he was able to fare well or not. He certainly had difficulty in flying. 2. I love the spots on it's wings. Does anyone know what type of moth this is? 3. On the first day of school, Pierce was supposed to fill up a small bag with ten of his favorite things. He put an antique glass eyeball (which he got from my grandmother's house) in there. Wish I could've been a fly on the wall for that show and tell. 4. Speaking of Pierce, recently at the grocery store we were standing in line, and he picked up on the fact that the bagger was wearing an orange visibility vest. He turned to him and said, "Are you from the prison? From the work crew?" I almost died. The cashier started laughing, then I started laughing. Then the cashier turned to the bagger and said very solemnly, "What'd you do?". The bagger, in his early 20s, didn't think it was so funny. 5. I love the smell of garlic. Guess there's no vampire in my blood! That is a Luna moth. Pierce is a smart one! How funny. Pierce made me laugh too. He is always thinking. I have no idea what kind of moth that is although I do think it's very pretty. Moths don't have a particularly long life span even with their tails intact. P.S. That moth is beautiful! Pierce is clever - smart & clever. How did so many stunning things get created - like that gorgeous moth . . What a diverse place this is. LOL on the prison vest! Pretty moth and I am giggling about Pierce and his observation! Pierce has such an honest curiosity! He's so smart. That's a beautiful moth--such a delicate color. Yep, it's a Luna Moth. Lovely creature. Pierce's comments were hysterical! Give him a hug for making me laugh. My husband just came in to see why I was laughing so hard. :-) Luna moth. Aren't they beautiful? What a pity it's wing is broken. yup, luna. loved the 'work crew' accusation! Oh my. Well, the orange vest story sure made me laugh! That moth is beautiful, we saw one years ago in the Ozarks. Oh! and the glass eyeball, sounds so much like something my son would include! I have seen those moths before and they are kind of pretty. That's a gorgeous moth. We've found some HUGE ones in our garage this summer. Never seen them before. Your son Pierce is a character....I LOVE kids with character!! We too love the smell of garlic; makes me hungry to smell it cooking. Beautiful moth. :). I think he's a Luna, but i'm not certain. I feel bad for its broken wing..
Lol snort at his prison vest comment! I love children's honesty. Beautiful Luna moth specimen. Used to see them in the Midwest every now and then. That story cracks me up - and I'm thinking the young bagger seriously needs to get a sense of humor - but then, that's just me. Have a great weekend! Too funny, and that is always my first thought when I see someone wearing an orange vest. Pretty moth! Amazing moth, it looks like a Luna!!! Well, I guess at times our kids will embarrass us as much as we will embarrass them when they get a bit older. It was a SMART comment though!!! He is observant and can spot a prisoner at close range!! Haha, Pierce is too funny! It really is hysterical what kids say sometimes. Cool moth! You Pierce sound very unique. We get Luna moths on our screens at night. They are attracted by the red security lights. The cats jump up and knock them down sometimes. When my daughter was little she was furious with the "kitties" for doing that and she was constantly rescuing the moths. Oh how funny children can be at that age. They sure do keep us on our toes! Mmm, I love garlic too. Hope the Luna moth faired well . One time Amy kept staring at a great big mean looking biker at the grocery store and then told him he had a big belly! I was afraid for our safety, but the man laughed and agreed with her! Your Pierce is a smart one! So funny! That is a big moth, beautiful looking. Hope it was able to fly away. Enjoy your weekend! Gorgeous moth! I hope it was able to fly away to safety. Pierce cracks me up. Gosh he's a smartie for his age. Love the story about the bagger at the grocery store. That Pierce is something else. I know he's a joy continually. I laughed so hard with the Pierce story in the grocery store!!! 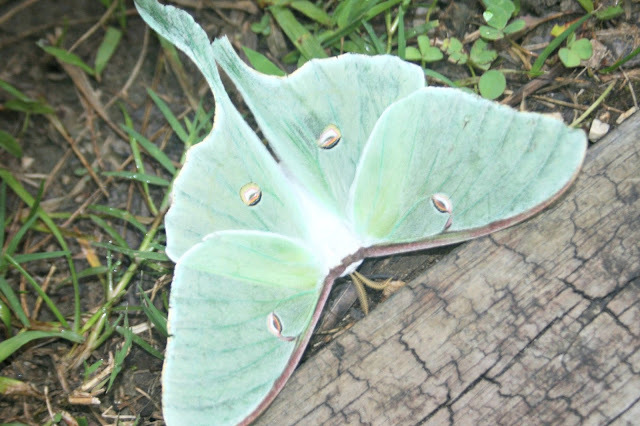 We have luna moths in Northern Virginia. I'm surprised you weren't familiar with them. I saw a Luna moth--once--at my daughter's. It was huge! Too bad we don't see more of them. Loved the grocery store encounter. Beautiful Luna moth. Pierce had me laughing, too. Great 5. Never seen a moth like that. Love the show and tell and vest story. Hilarious. I have never seen a moth so beautiful in my life! Sorry we have been missing from blogland. We are trying to get better. Luna moth. Odds are, he was probably dinner for some birdie after you rescued him...sorry. They fly at night, hence the name. LOVE the bagger story! That's hilarious. I'm sure they are still razzin' that poor guy! Still giggling at your son's question - and it really was a valid question! That moth is gorgeous. Garlic is one of my very favorite smells. I want to see that glass eyeball now. LOL! That's so funny about the bagger at the grocery store.